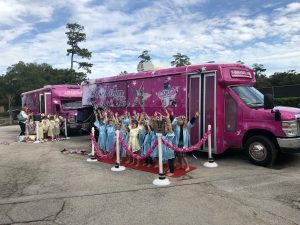 Have you found the best little girls birthday venue Katy TX has to offer yet? There are plenty of options that might be great choices. However, we believe that we have just what you’re looking for. After all, who else can provide a sensational spa day experience all in the comforts of your own front yard? This is a bit of a game changer, we know. If you haven’t had heard of this amazing new venture, you’re sure to be in for a treat. Just imagine your daughter’s smile when she finds out she’ll be having the spa bus experience. She can invite all of her friends for the ultimate makeover and enough fun to laugh about for days to come. The number of amenities that we provide will have her busy every second of the event. There will be plenty of unique offerings which build on top of each other so that the party feels organized and carefully detailed. That’s because it is! Rockstar Spa Bus dedicates immense effort to orchestrating one-of-a-kind party extravaganzas that you won’t find anywhere else. Our joy is in building up your little girl with the most confidence and excitement because we all know she deserves it! We all know the tedious workload of setting up a young girl’s party. Not only must it be beautiful and exquisite, but it surely must come with all of the features to make her special day unforgettable. That’s a tall order for parents who probably work most days out of the week. They won’t always have the availability to make sure everything is planned out properly. What’s more is even if they do find a way to fit it into their schedules, you shouldn’t have to work so hard just to make an enjoyable time. You could be spending so much time planning that you end up dreading the day when it arrives. We don’t want you overworking just to pay for a party that you won’t be able to enjoy yourself, too. We know it’s about the birthday girl, but that doesn’t mean that her parents should be sacrificed at their expense. This is why Rockstar has a flurry of packages which can fit all kinds of different themes and styles. This way, you can let us take care of the party planning instead. We have an excellent history of creating the greatest parties around for girls. If you allow us to be your venue of choice, you will find there is a huge weight lifted from your chest. No longer will you struggle to try to fit in the work to plan and prepare for the party. You can instead, simply relax and enjoy this special day. Every aspect of our mobile spa bus is going to thrill and excite her. The scene we create will amaze you. Right from the very beginning, she is treated like royalty. Our aim is to pamper and spoil her, after all! With the scintillating red carpet rolled out for her entrance she is welcomed into the bus as our esteemed guest. Her own party guests will follow in her stead, certainly amazed by the incredible atmosphere. When a giant pink bus arrives at your doorstep, it might be hard not to be excited. Nevertheless, the fun has only just begun. Depending on the package you choose, she and her friends can be given spa robes and prepped for the manicures and pedicures. Her nails will be painted with all sorts of different designs while her hair is brushed with care. We even have huge TVs that are set up throughout the pink and zebra print interior. The giant mirrors that surround them will be the perfect stage for their karaoke which is a feature of the TVs that have youtube and vevo installed and ready to go. Everything from the props and glitter to the foot massages and icy cucumber facials will be divine and one of a kind. It certainly won’t compare with any other party you’ve been to recently. There simply isn’t a competitor who can match the luxurious fun we offer for the price we can do it for. The especially won’t be able to set up right there on the curb of your home! This is an incredible experience not just because of what we offer, but purely on the premise alone. Imagine the possibility of having something like this even 20 years ago. It simply wouldn’t have been available because of the lack of technology and accessibility into the spa world. After all, if you’ve ever been to a spa you know that its no joke. They can end up being very expensive even just for one treatment. That’s why we’re so excited to offer this to you and your daughter, we can provide you something that would normally cost an arm and a leg. However, it won’t just be your daughter who gets to enjoy it, but all of her friends also. That’s as cost-effective as it gets! We finally have the ability to give you a revolutionary mobile spa that still has the all of the quality and splendor of a spa, but at a reduced price and with the ability to meet at your home. We want to create the most extravagant time for kids birthday parties because we believe luxury and self-confidence go hand in hand. At this age, these are some of the most important characteristics to nurture. If you have an interest in scheduling a party with us, or you need more information about it just give us a call! Our hostesses are always ready to answer any questions you may have. Call us at 1-844-GIRL-SPA (4475-772) or simply visit our website to find more about our services. Our priority is in creating the most lavish environment for the special birthday girl. One that she will surely not forget for a long time. We hope to hear from you soon, let us make your little girl as happy as can be — without demanding all of the hard work from you! For more information about Katy TX, click here!